It’s nigh on my favourite time of year. I’m not referring to the festive season of any variety. What I’m talking about is peach season. 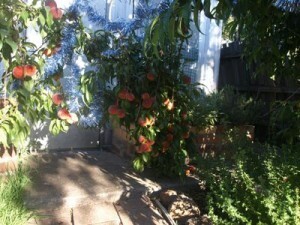 We have the most wonderful peach tree. It was here when we bought our house, I’ve no idea how old it is. What I do know is that every year for the past eight years, it hs given proressively more fruit. Furthermore, ervey year, the fruit tastes better. Juicier. Sweeter. More delectable. Every year we think it can’t possibly improve any more, but every year it does. 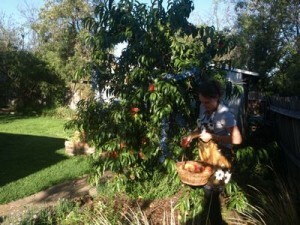 Today, I picked the first 4.2kg of peach perfection. i think I said it last year! YUMMO! they look stunning and I can’t believe that they taste even better than when i had some last. Lucky girl!!! Merry Christmas Eve to you too. And Z and those gorgeous kidlets of yours. Oh. My. Goodness. I am officially very, very jealous. And fair enough too Docwitch. She’s a tree of wonder. I cannot speak her praises highly enough. Peach season is my favorite too! Seriously, I get equally excited for Christmas and peaches. 🙂 My mom has a delicious peach tree in her yard; I’m jealous of her and of you! That’s the beauty of Australia Fig. Peach season is Christmas : ) Although we have the Arizona contingent on the phone right now and they’re having a white Christmas which sounds lovely too. Thanks Nate. All peach usage suggestions gratefully received! Merry Christmas to you and yours too!